WASHINGTON, DC – Give a kid a good story he or she can relate to and the child will become an enthusiastic lover of books, says author and publisher David Bruce Smith. It’s a fact that schoolchildren are not born with a desire to read. There are plenty of studies that confirm it: too many young learners have an aversion to books, and their parents are stressed about their kids’ reading proficiency. So, how can you get your children and grandchildren to become more avid bibliophiles? “It’s not going to happen if you put together a selection of so-called ‘appropriate’ books. You need to let them pick what they want to read,” says Smith. Smith is the co-founder of the Grateful American Book Prize, the brainchild of the late Dr. Bruce Cole, former chairman of the National Endowment for the Humanities. Cole inspired Smith to establish the Prize as a means of encouraging authors and publishers to produce more works of historically accurate fiction and nonfiction for young readers. The idea was to capture the imaginations of children, give them an incentive to explore the history of America, and—hopefully— jumpstart a love of reading in them. “It is well established that too many middle and high school students have a history deficiency. They seem to be bored in history class because the teaching standards are based on memorization and rote. Let’s face it: history textbooks may provide the facts and timelines, but they don’t tell stories that are interesting to kids. But give them a novel— or even a true life story about an historic event or a person— and they become curious—leaving them wanting to know more,” says Smith. Why is this essential? Because knowledge of the important events of our country, why and who made them happen, ensures that young people will grow up to be responsible, participating, citizens. Hidden Figures, by Margot Lee Shetterly, is an excellent example of how “humanizing” the facts of history can be whipped into a context that young readers appreciate. This book, a work of historical nonfiction that was made into an Academy Award nominated film, received the 2017 Grateful American Book Prize. It tells the story of African-American women mathematicians who worked at NASA and overcame racism in the early days of America’s space program. Jennifer Latham’s Dreamland Burning, a work of historical fiction– also about racial injustice—received a much-deserved Honorable Mention in the 2017 Prize competition. Edward Cody Huddleston’s The Story of John Quincy Adams 250 Years After His Birth, also received an Honorable Mention Award in 2017. The Drum of Destiny, by Chris Stevenson, was the 2016 winner of the Prize. Freedom’s Price, by Michaela MacColl and Rosemary Nichols, was awarded an Honorable Mention in 2016. Laura Amy Schlitz for her work of historical fiction, The Hired Girl, also won an Honorable Mention in 2016. Like a River: A Civil War Novel, by Kathy Cannon Wiechman, won the first Grateful American Book Prize in 2015. Darlene Beck Jacobson’s novel, Wheels of Change, received an Honorable Mention in 2015. The Revelation of Louisa May, by Michaela MacColl also was awarded Honorable Mention in 2015. NOTE TO EDITORS: Books of fiction and nonfiction that are eligible for the 2018 Prize can be submitted until July 31, 2918. They must be historically accurate and geared for children ages 11 to 15. Submission information and forms are available here. Willa Cather’s, LUCY GAYHEART; a girl leaves her home town to study music in Chicago. Shashi Ishai’s, ASK AVIGAIL: ADVICE FROM A BIBLICAL-ERA SAGETTE; a Dear Abby-like sage from the times of Moses tarries with Erma Bombeck and Woody Allen in the desert. Join us on Friday, March 2, 2018 – during Downtown Chestertown First Friday – for the opening of the Kent County Arts Council’s (KCAC) next exhibition: “Heroin & Healing”, a New Day Campaign program curated by Peter Bruun of Bruun Studios. Across the country stories of heroin and other opioid overdoses are leading the evening news. Young and old, black and white, rich and poor, the disease is an equal-opportunity killer. Peter Bruun created the New Day Campaign =around the concept of using the arts to help erase the stigma of addiction and helping families and communities begin to heal. Prior to founding the New Day Campaign in 2015, Bruun served as founding Exhibitions Educator for The Park School of Baltimore from 2000-2005, pioneering a gallery program that put side-by-side works by local and national artists with art and objects from and by Park student and faculty. In 2005, seeking to expand his artistic, curatorial and social engagement reach to all of Baltimore, Bruun founded the non-profit organization Art on Purpose, dedicated to using art to bring people together around issues and ideas. In June 2010, Bruun stepped down as founding director of Art on Purpose to pursue full time his own social engagement studio practice under the aegis of Bruun Studios. Bruun founded the New Day Campaign in early 2015, following the death of his daughter Elisif from heroin addiction in 2014. KCAC Director John Schratwieser met Bruun in Baltimore and attended a few New Day Campaign shows in 2015. He invited Bruun to come to Kent County and work with local practitioners, nonprofit and government service agencies, and Washington College to create an exhibition and program of related events to engage the community in a broader, more open conversation about addiction and healing through art. Elisif Bruun, daughter of Peter Bruun, died of a heroin overdose on February 11, 2014, leaving behind a precociously strong body of diverse artwork. The exhibition includes her last drawing: a self-portrait completed just 20 days before her passing. Peter Bruun, exhibition curator and father of Elisif Bruun, is a long-time artist whose figurative abstract art carries layered narratives. The exhibition features a watercolor drawing inspired by his daughter’s journey that invokes the tension between desiring grounded wellness and an unsteady mind’s impulse toward self-destructive behaviors. Phylicia Ghee is a photographer and healing artist who presents and documents ritualistic performances rich in spiritual expression and sensory experience. Phylicia, who was the Resident Healing Artist in the New Day Campaign’s 2015 inaugural season, will exhibit a video in the exhibition. 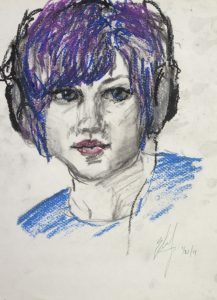 Michelle Labonte is a Baltimore-based artist whose work documents her feelings, observations, and perspectives from living with debilitating depression and other related disorders. The artist’s works in the exhibition offer an illuminating look inside the heart of someone hurting. Mark V. Lord is a photographer whose 2016 photographs of individuals who saved lives by administering Naloxone to opioid overdose victims where featured in a 2017 Maryland statewide public awareness campaign. A selection of photographs from that project will be included in the exhibition. Anthony Ness, who lives near Washington DC, is a person in recovery whose colorful hyper-realist art expresses his emotional journey through using and sobriety. Several of his works will be included in the exhibition. Sharon Strouse is an artist and art therapist. Since the passing of her daughter, Kristin Rita Strouse, from suicide in 2001, Sharon has immersed herself in healing from grief. The author of Artful Grief and a nationally known presenter in art therapy and recovery from grief, Sharon will share some of her own collages created in her own therapeutic journey after Kristin’s death. GALLERY TALK – Saturday, March 3, from 2 – 4 p.m. Join Peter Bruun and other artists featured in the show for a conversation about their works. Raimond Arts Building. OPEN MIC & CLOSING RECEPTION – Saturday, March 31. Open Mic – 3 – 5 p.m. Sharing/Informing/Healing: An Open-Mic Experience is a community-oriented event sharing a wide ranging spectrum of experiences and feelings related to the opioid epidemic specifically and addiction generally. Rich in fellowship and hope, the event features music, stories, open mic opportunities, resource information, and a special slideshow highlighting remembrances of those we have lost, expressions of gratitude for those who have been there for us, well-wishes for those who are hurting, and art of all kinds related to recovery, wellness, and hurting. Featuring Sombarkin’. Garfield Center for the Arts. CLOSING RECEPTION Saturday, March 31. 5 – 7 p.m. Raimond Building. The Kent County Arts Council and the New Day Campaign are proud to be working with multiple local partners/sponsors. They include: REACH: Prevention, Education, Advocacy Center at Washington College; Maryland Coalition of Families; Kent County Behavioral Health & the Opioid Intervention Team; Eastern Shore Psychological Services; Chester River Wellness Alliance; and Herbal Alchemy. George Washington University’s Department of English and Jewish Literature Live proudly present a reading by award-winning poet Owen Lewis on Tuesday, Jan. 30, 2018 at 8:30pm. Lewis has authored two collections of poetry, including the Marriage Map and Sometimes Full of Daylight. He is a psychiatrist and professor at Columbia University, and he plans to discuss the intersection of Judaism, poetry, and psychiatry in his evening lecture. The event will be held at George Washington University’s Marvin Center Amphitheater (800 21st St NW). Last December, Kent County residents and visitors alike were treated to a delightful stage production of the classic Christmas movie “Miracle on 34th Street” at the Garfield Center for the Arts. We’ve lost count but we are pretty sure that this is the 1 millionth production that has been produced, directed, or had a cast led by either Jim or Diane Landskroener in the last 40 years. All kidding aside, the Landskroener’s have been a staple on Kent (and Queen Anne’s) County stages since 1980’s. Together they have asked some of the most important of life’s questions, such as “who’s on first?” “why is nobody listening?” “to be or not to be?” and even “Is Santa Claus real?”! Jim and Diane, with colleagues like Vince & Leslie Raimond and Kate Bennett, Kate Schroeder, Vincent Hynson and countless others, have created one of the best, most welcoming environments for theater artists anywhere. And it doesn’t stop there, they are educators, designers, administrators, and more. Together they have co-hosted the annual Dancing with the Stars Event to benefit Horizons of Kent & Queen Anne’s County. For years Jim has MC’d the wildly popular Chestertown Tea Party Raft Race. He has been an educator at The Kent School for 30 years, and directs their annual spring Musical every year. He’s also entering the final year of a two term commitment as the Chair of the Board of the Garfield Center for the Arts. Diane spent 20 years as a graphic designer at Washington College now freelances and donates her time and talent to many nonprofit organizations and her thoughtful and inspired design work can be seen in organizations all over Kent County and across the internet! Having most recently played the creepy Dr. Sawyer in Miracle on 34th Street, she’s also recently directed “Love, Loss and What I Wore” at the Garfield. Created in 2006, the Kenny Award honors Kent (hence Kenny, like the “Annie in Anne Arundel County, and the Howie in Howard County) County residents who have gone above and beyond in their giving to talent, energy, and resources to increase the quality of life in our County. We are honored to announce their selection as the 2017 Kenny Award Winner. The award will be presented on Friday, February 2, 2018 at 7 p.m. at the Garfield Center for the Arts. All are invited to come an applaud the honorees. The event is free, but reservations are required. Please call the Kent County Arts Council at 410-778-3700 to reserve your seats (or email johnschrat@gmail.com). There will be a light dessert reception following the program. The Hedgelawn Foundation provides competitive grants to support humanities and arts organizations on Delmarva, and research initiatives in Venice, Italy. The Foundation’s Board is chaired by Judy Kohl. The Kent County Arts Council seeks to invest in, infuse, inspire the arts in Kent County Maryland. KCAC provides competitive grant awards for nonprofit arts organizations as well as Project grants for artists and community organizations producing arts programming. back: Pat Dias, Kate Schroeder, Paula Knowles, Barry Bedwell. WASHINGTON, DC – The Grateful American Book Prize is accepting submissions for its 2018 awards. The Prize comes with a cash gift of $13,000 representing the original 13 colonies. The winner also receives a medallion created for the occasion by Mr. Smith’s mother, the noted artist Clarice Smith. In addition, two books are selected each year whose authors receive Honorable Mention medallions and $500 each. The winner of 2017’s Prize was Margot Lee Shetterly for her non-fiction work, HIDDEN FIGURES, a number one New York Times best seller, which tells the story of the pioneering African-American women who overcame racial barriers at NASA in the 1960s. The 2018 Panel of Judges for the Prize includes Smith, Dr. Louise Mirrer, President and CEO, New-York Historical Society; Dr. Peter S. Carmichael, Robert C. Fluhrer Professor of Civil War Studies & Director of the Civil War Institute at Gettysburg College; Neme Alperstein, a teacher of Gifted and Talented Students in the New York City Public School system since 1987; Dr. Douglas Bradburn, author, historian, and president/chief executive officer of George Washington’s Mount Vernon; and John Danielson, Chairman of the Board of Directors at Education Management Corporation. EDITORS NOTE: The Prize will be awarded to the authors of books for children in grades seven through nine about important events and people in America’s history. They can be works of historical fiction or non-fiction. We are looking for excellence in writing and storytelling. Books published between July 1, 2017 and July 31, 2018are eligible. The plot of the book must focus on historic American events and/or personalities. Writing style needs to appeal to young learners in grades seven through nine. Works of historical fiction and non-fiction are eligible. They may include illustrations that appeal to children in the seventh through ninth grades and reflect the highest standards of artistic creativity. Historic accuracy is very important. Non-fiction works must describe events and individuals in a manner that is well researched and documented. Fictional stories must accurately convey the times in which they are meant to occur.